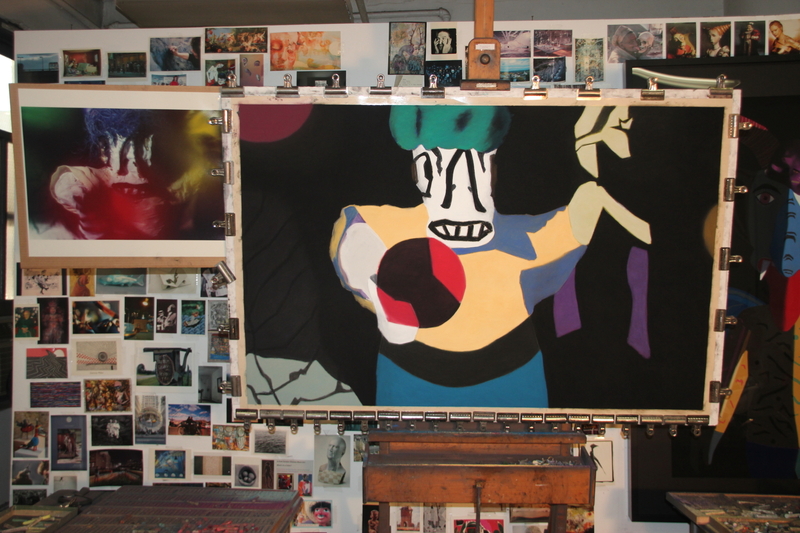 Posted on October 19, 2013, in Art Works in Progress, Black Paintings, Creative Process, Inspiration, New York, NY, Pastel Painting, Photography, Studio, Working methods and tagged "Art Brut", easel, happening, today, week, working. Bookmark the permalink. 4 Comments. Hi Barbara, What does Art Brut represent to you? Why do you like it? How does it connect with your life experiences? Laurel, this particular “Day of the Dead” figure always has reminded me of something Jean Dubuffet might have made, particularly the way it looks at this stage in this particular painting. It’s the color and the rawness, I think. I have a long-standing admiration for Dubuffet and Art Brut. On my last trip to Paris in 2011 I was thrilled to finally visit his house and museum. Thanks for asking. I hope all is well with you. Laurel, there is no connection beyond what I’ve said. I am an admirer of Art Brut and my comment applies only to this particular image of a work in progress. I don’t see the rest of my work as having anything to do with this style.